$20 admission. July 30, Houston,TX. $150 to perform (7 minute limit). Rappers,Singer,poets,Dj’s who are serious about their careers in the music business, come out and NETWORK. THIS EVENT PRESENTS A GREAT OPPORTUNITY FOR ARTISTS TO BUILD BETTER CONNECTIONS IN THE MUSIC INDUSTRY. This is your chance to show up and show out. This is your opportunity to reveal your God given talents,to industry veterans. Don’t let your music be realer than you, be realer than your music! 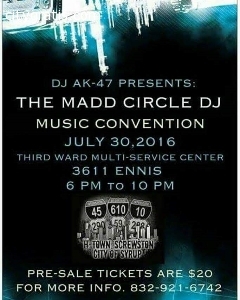 This entertainment game is 99% grind 1% talent, so get with movement brought to you by HOT 94 JAMZ RADIO GROUP, THE MADD CIRCLE MOVEMENT, COAST 2 COAST MIXTAPES, DJ’S,STUNNA DJ’S, RTR DJ’S, NERVE DJ’S and Dj Ak-47. So all independant artist come show love and support each other, bring your cd’s, flyers, business cards and get your network and grind on…………..